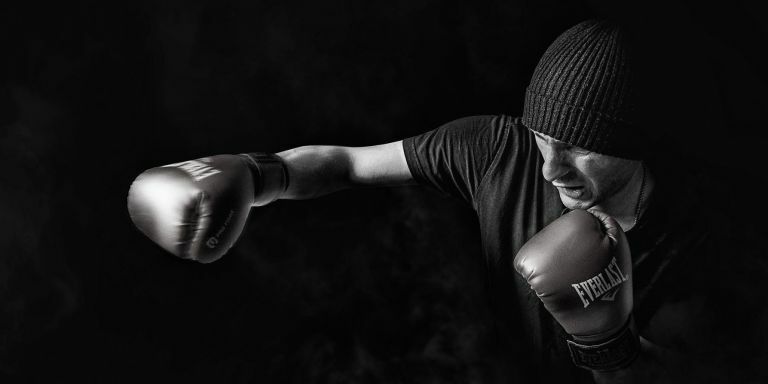 With the boom in combat-based fitness training and even 'white collar boxing' (plus its ancient and less la-di-dah predecessor, 'no collar boxing') there's never been a better time to discover just what is the best boxing glove. These high impact sports test more than your stamina, coordination and skill. The punches you throw at either your opponent or training equipment test your gloves, too, which makes investing in a decent pair a good move. Sure, many gyms will rent you a pair, and we're not hung up on hygiene or anything but come on; you want your own. What is the best boxing glove? For those looking to get fit, rather than become the next Anthony Joshua, a full-size, traditional Western boxing glove is not necessarily what you're after. Something lighter and easier, like an MMA or Eastern martial arts glove (for muay Thai, for instance), or a lighter Queensbury Rules glove could well be a better bet. However, if you are intending to punch slabs of meat full-force, in the style of the first Rocky film training montage, you want the best glove you can get, because the alternative is being introduced to mister T's friend, Pain. And also Mr T's other friends, 'agonising hand fracture', 'nerve damage' and 'bone deformity'. For those new to the sport, there are three types of glove out there – training gloves, sparring gloves and competition gloves. Training gloves are designed for hitting bags rather than people and can go two ways. There’s some that are lower in weight – good if you want to feel the punch and and learn the technique – but not so good when it comes to absorbing impact. There’s also heavier gloves, which boxers use to build their stamina and endurance. The typical training glove weighs 12oz. Then there’s sparring gloves. They are for use with your training partner in the gym. When you’re training against your partner, typically 16oz gloves are used, as they build stamina and protect you and your opponent from becoming injured before the big fight. In the ring, an amateur lightweight competitor could wear 10oz gloves, while pro heavyweight boxers need 12oz gloves with more padding. But no matter which level you’re at, your gloves will need to be decent quality to last. Make sure you buy leather gloves that are stuffed with good padding. Although pro gloves lace up, there's a lot to be said for Velcro for training – just try lacing up that second glove when you're on your own, and you'll see what we mean. Discover the best boxing gloves on the market right now by having a read of our guide below. The Muay Thai boxing gloves are great all-rounders but incorporate a design that greatly lends itself to kickboxing rather than regular boxing. That’s not to say regular boxers can’t invest in them – they’re great for training and sparring- the only difference is they have a longer wrist for blocking kicks and a slightly more open palm for catching elbows. This Fairtex leather boxing glove boasts three layers of evenly distributed padding, which the brand says will offer excellent hand and knuckle protection and shock disbursement. Available from 10oz to 16oz, there’s a pair for every style of training – from hitting pads to sparring in the gym. The brand claim they’re tight fitting too, so much so the consensus among reviews is larger hands may find the fit too tight. These are used by pro boxers everywhere, due to their combination of comfort and strength, to you, they feel like wearing big, comfy pillows. To whatever you're punching, less so. Made to exacting quality standards in Japan, they also offer superb support and durability. They are, perhaps, a bit of an overkill if you're just after a 20-minute gym boxing session set to pounding techno music. The training gloves are 14oz, or you can go for the 'Fight' variant of the Winning formula; they're 8oz. Muay Thai boxer or not, if you’re investing in a pair of Twins, you can pretty much guarantee yourself an amazing pair of gloves. As with the Fairtex gloves above, they’re primed for Muay Thai, but the additional hand and wrist support will make them a great glove for training and sparring in regular boxing, too. Available in a range of sizes and colours, you’re free to pick a glove that meets your requirements; whether it’s a small training glove for pads and bags or a heavy pair for building your endurance and/or recreating the fight scenes from Ong Bak. Venum is also another highly rated brand. This glove comes with a few extra perks, including the mesh thermal regulator, which prevents hands from becoming overly sweaty during intense training sessions. As with the previous brands, there’s triple layer padding and reinforced palms which makes them great for training and sparring, however reviewers mention other pairs may be better for heavy bag work. Made from Skintex Leather, they aren’t genuine leather, but the brand still boast that it offers ‘premium level quality’. If you can’t quite afford the big boys, these gloves come in at a close third. When it comes to technical capability, these gloves are pretty up there. They feature a range of materials that make them very breathable and dry if you’re worried about sweaty hands. Thanks to the leather construction, they will take lots of pummeling when it comes training with equipment and sparring. Because they’re only available in 14oz or 16oz, they’re good for sparring but not so much for competitions, where a lighter weight glove is required. The only other downside is the colouring, which while perfectly fine, won’t give you kudos points in the gym… unless you’re the only one with dry, sweat-free hands! Whether you’re looking to go pro or just want a decent pair of gloves to wear in the ring, these ones from Adidas should fit the bill. Reviewers commend their quality and comfort, while the buff leather outer and triple layer foam should provide ample protection in the ring. Because these gloves are only available in lighter sizes, they don't offer enough protection for sparring, but should be okay when using pads or lighter bags. Thanks to the extra thick padding and the layer of shock dissipating gel, these gloves are great for training and sparring. Despite being lower priced than some of our other well-known gloves, the reviewers rave about the durability and comfort that these gloves offer, so don’t feel like you have to pay for a household brand to invest in quality. Additional features of these gloves include a S.P.P incorporated palm, which filters air into the glove and prevents hands from becoming too hot and sweaty. The common consensus seems to be that these gloves appear quite bulky, even for the smaller sizes, but still provide a secure fit internally. Understandably, you may not want to pay an arm and a leg if you’re just starting out. A good glove that offers up ample padding will probably be enough to develop skill and technique when you’re using heavy bags and pads. The gloves are also ventilated thanks to the M Core ventilation mesh. Once things become more serious, it’ll be worth you investing in a leather pair, as they offer up more durability when it comes to longer training sessions, but for a cheap synthetic pair, these are probably the best you’re going to get.